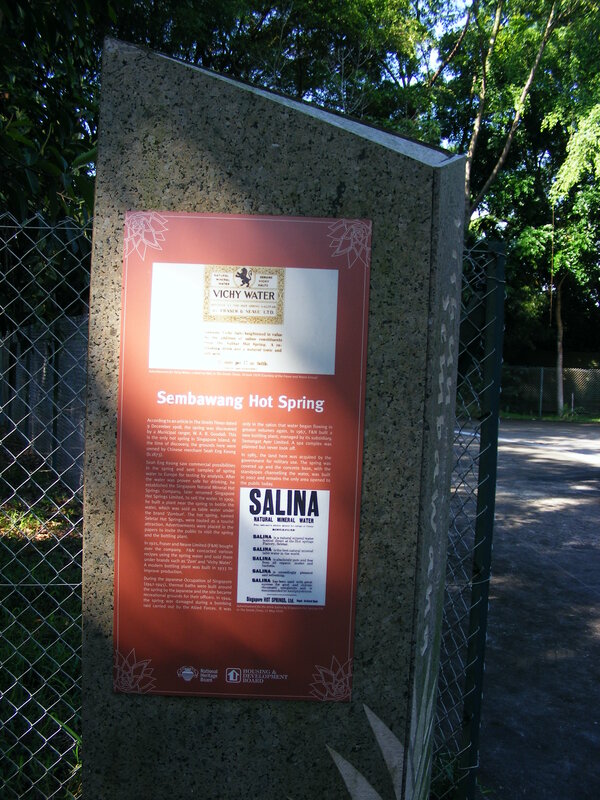 Singapore has a natural hot spring! Who knew? I’ve been to hot springs before and they are typically teamed with “treatments” like massages and floatation tanks that cost a great wad of cash, but Singapore’s hot spring is free and very low-key. So low-key that there are no signs on the main road. 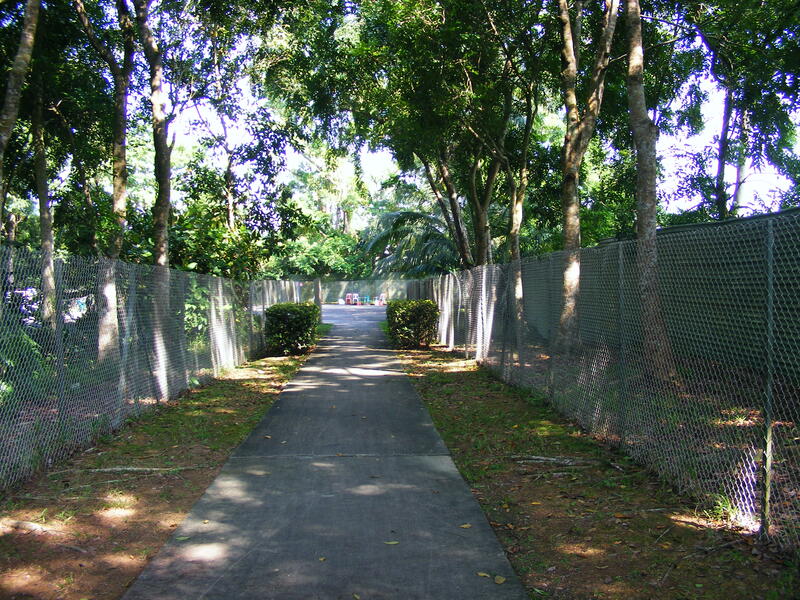 The land that the hot spring is on belongs to the Sembawang Air Base but there’s a public walk way from Gambas Avenue to the spring, although there aren’t any signs on Gambas Avenue itself. Parking is about 400 metres away in the HDB’s on Yishun Ave 7. 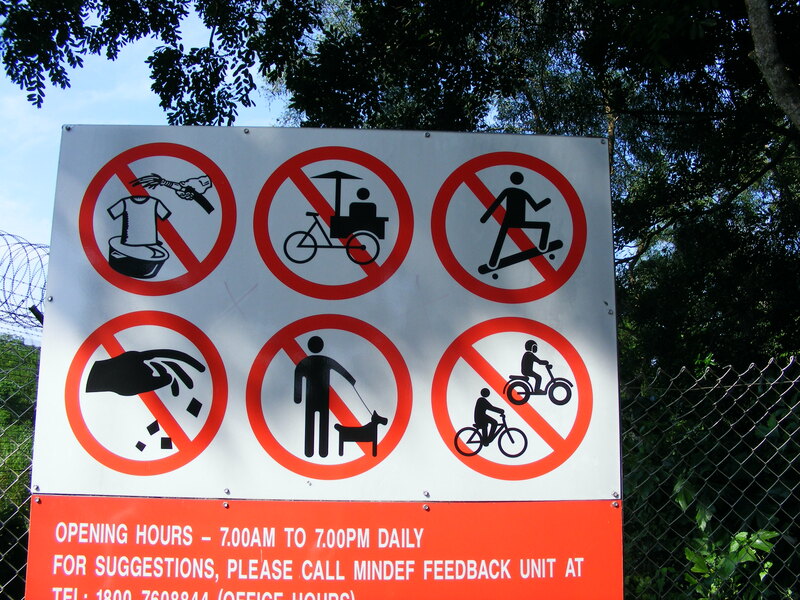 Walk down the pathway at this sign on Gambas Avenue, but do not wash your clothes, set up an ice cream stand, skateboard, litter (? ), bring your dog or you bike/motorbike! Keep walking, you’re almost there! Once you see this sign you know you’ve made it. The area is an open concrete space with three sets of taps and a brick pump house in the middle. 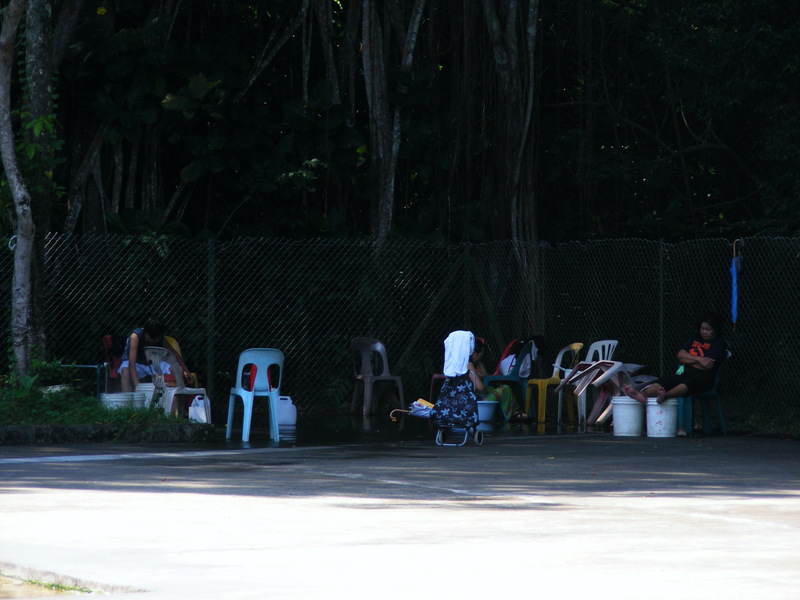 There are lots of plastic chairs and buckets about so you just grab a chair, fill up a bucket and do your thing. 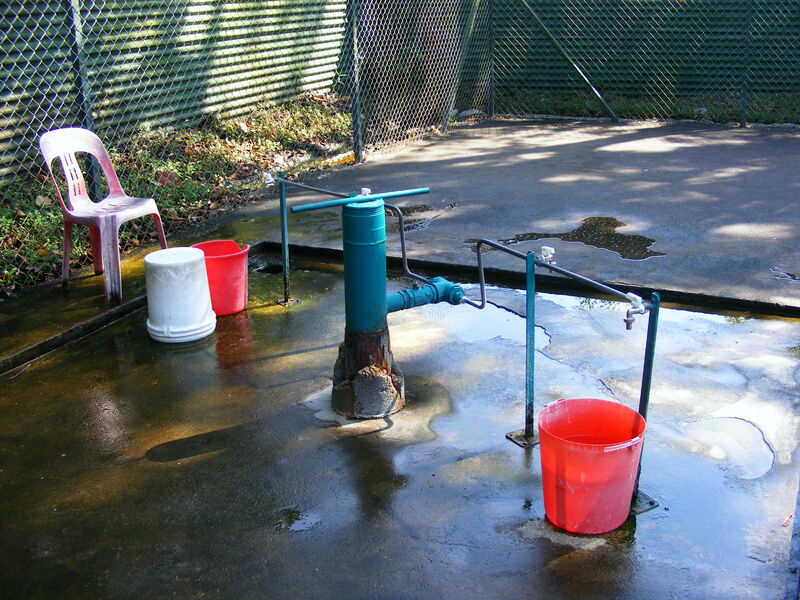 Although you may need to wait awhile as the water is very hot, and if you use the set of taps in the middle of the area you’ll find that the water is at boiling point. At one point while my friend and I were trying to put our sensitive feet into a bucket of piping hot water a local lady came over to gather more buckets, and she told us that she comes to bathe here every day. I tried to ask what were the benefits of bathing in this water but it got lost in the translation. A couple of friends and her were set up in the opposite corner to us and while they kept their clothes on they were washing their whole bodies and, I think, some clothes. Apparently the water is safe to drink (or so the information sign says) but it has a very strong sulphur smell so i wasn’t tempted to try. It was an interesting and quirky adventure! Locals. The lady behind the granny trolley is sitting in her bucket. 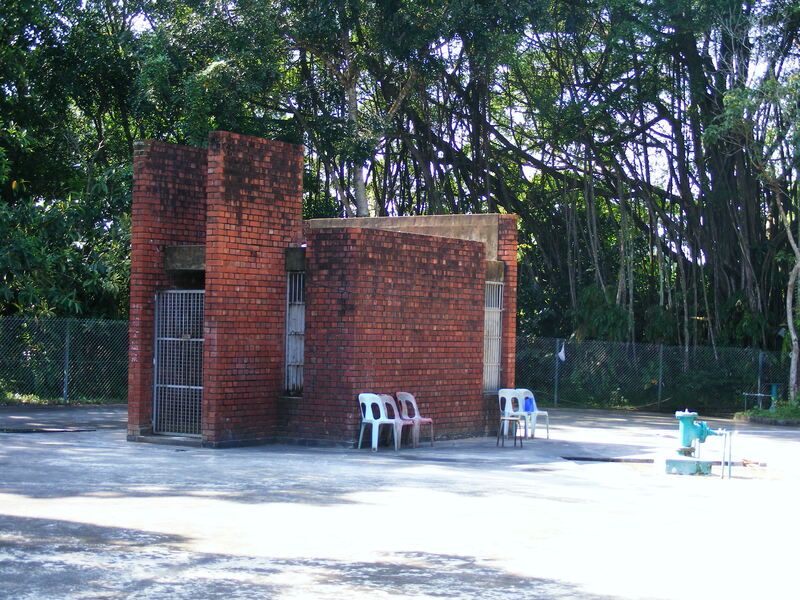 Sembawang Hot Spring is at Gambas Avenue, Sembawang. Operating hours are 7am until 7pm. 2 years here and i had no idea Singapore had a hot spring! Great find indeed! When visiting this Hot Spring, don’t forget to go for Roti John! after that. I missed it but ” on the red dot” last night it was about here.